These are the tastiest snack bites, and easy enough for the kids to make! 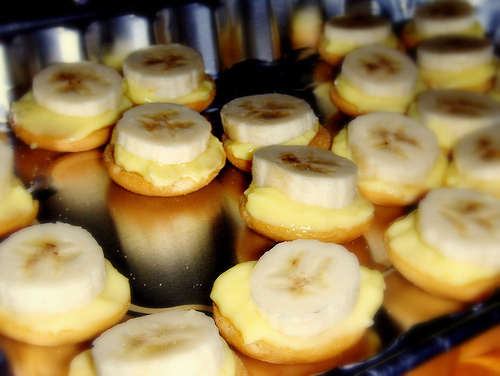 Serve immediately to avoid brown banana slices. They can be assembled with store bought pudding, or try your hand at making it from scratch. 1. In a medium heavy weight sauce pan combine sugar & corn starch, stir in milk. Cook, while stirring over med heat until thick & bubbly. Be careful not to burn bottom- a heat proof spatula works great for scraping the bottom. Once bubbling, cook while stirring for 2 minutes more. Remover from heat. 2. Gradually stir in 1 cup of milk into beaten egg yolks, then add this mixture into the hot pan. Bring to a gentle boil; reduce heat and cook, while stirring, for 2 minutes. Remove from heat. 3. Stir in butter and vanilla. Pour into a storage container and cover with plastic wrap. Refrigerate for at least 2 hours, till firm. For the banana bites, assembled as pictured. Wow, what a great idea! These look amazing!